Bill and I have made the drive between Phoenix and Denver approximately a million times. Well, I’m exaggerating, but it has been very, very many times. For the most part we have not deviated from the quickest route. Oh, it’s true once in a while we have taken I-40 all the way to Flagstaff and come in from the west if the weather is iffy. But most of the time we take I-25 south to I-40, get off I-40 in Holbrook, AZ, and take a couple of state highways that bring us right down into Mesa almost directly to our house. It’s a pretty drive and we know it like the back of our hands. But a couple of months ago I read a light-weight mystery called Sister Eve: Private Eye, by Lynne Hinton. I didn’t review the book because frankly I didn’t like it much. It had so much potential – a Catholic nun investigating murders; seemed like it could write itself. But it simply didn’t read well, or at least not to me. Since it’s a series, I might try the next one to see if the author got any better. Anyhoo, one thing I did like about the Sister Eve book is that it took place in an area of New Mexico about which I was unfamiliar. 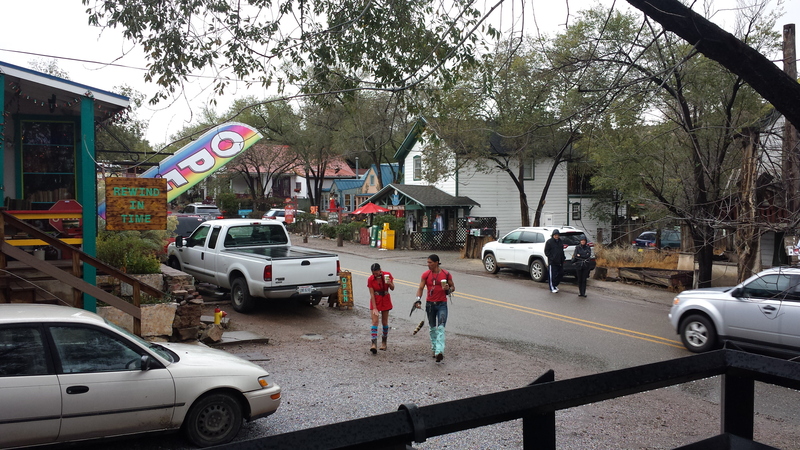 The good sister lived in Madrid, New Mexico, a town on New Mexico State Highway 14, which runs basically between Santa Fe and Albuquerque. This highway is referred to as the Turquoise Trail because from as early as 900 A.D., the Pueblo people mined turquoise, that beautiful blue-green stone which screams SOUTHWEST. (See how I indicated screaming by capitalizing the letters? Sometimes my cleverness astounds even me.) There are several little tiny communities along that trail, but Bill and I stopped in only one – Madrid. We stopped because it was the community with which I was familiar from the book, but also because it was just so darn cute. Madrid (which apparently is pronounced with the accent on the first syllable as emphasized over and over by Sister Eve) sits at about the middle of the Turquoise Trail. Though turquoise was probably mined there at one time, the bulk of what was pulled out of the mountains surrounding Madrid was coal, and lots of it. No more, of course. In fact, the town sat nearly vacant after the coal market went away, and the Wall Street Journal advertised the whole town for sale for $250,000 in 1954. Dang, I wish my dad had bought it. I could be mayor. As I mentioned, there are a number of towns on the Turquoise Trail, but the day that Bill and I traveled that lonesome road (and it was, indeed, lonesome), it was raining and not conducive to exploration on foot. 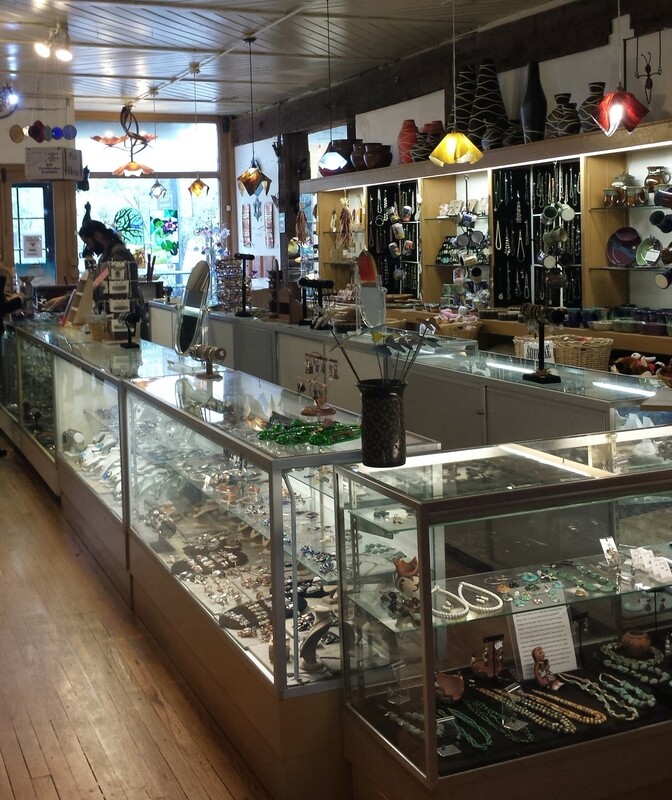 We did park our car and enter one jewelry store where I bought a couple of pairs of turquoise earrings (when in Rome……) for a great price. There were only a few people in the store, and at one point the lone salesman left to go look for a box for another customer, leaving me to peruse the earrings. It made me laugh, however, because the earrings were sitting out in the open, as was much of the jewelry. He was gone for quite some time, so had I been an evil-minded crook, I could now own 20 or 30 sets of turquoise earrings, a handful of rings, and enough necklaces to look like an African princess. You’ve gotta love the trusting souls of Small Town America. 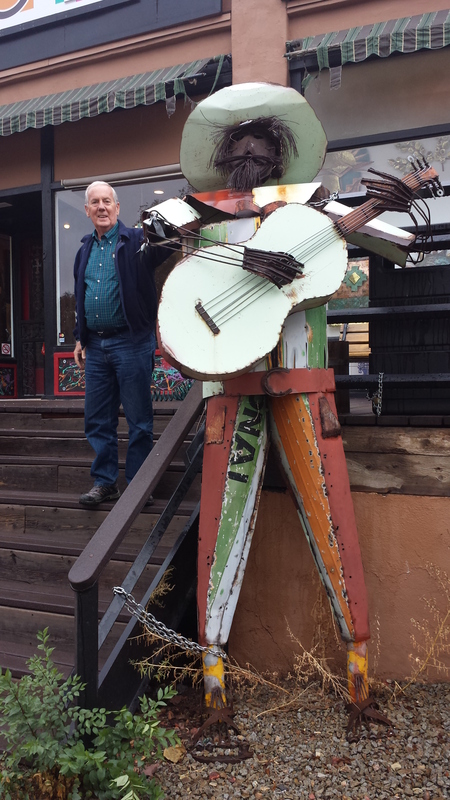 As we left the little store (which does a much better job with its jewelry than it does its coffee – just sayin’), Bill made friends with the store’s greeter, a friendly metal one-piece mariachi band. Since the scenic Turquoise Trail bypass took only a little bit longer than the normal drive from Santa Fe to Albuquerque, I recommend a detour if you’re ever in the area. I definitely want to go back some day when the skies are as blue as the turquoise jewelry! I’ve been living in Arizona full time for a little over two years, and it’s time I start getting to know my state a little better. 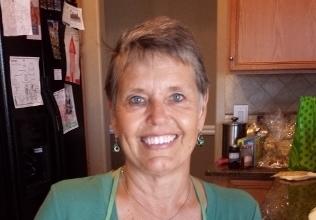 I’ve been to the Grand Canyon, and I visited Sedona years ago. I’ve blown through Flagstaff, Winslow, and Payson on my way to or from Chandler. But, this is a big and beautiful state, and I want to get to know it better. So, I spent last weekend in Willcox, Arizona. I had never heard of Willcox and had no idea even whether it was south or north of Phoenix. When I mapped it, I discovered that it is a bit east of Tucson, and quite close to the Mexican border. I also learned that one of things that takes folks to Willcox is the thousands of sandhill cranes that migrate there every winter. Hence, the trip. When I first got to Phoenix several years ago, I became a member of the Desert Botanical Garden because of an offer on Groupon. It was a wise and fortuitous decision, because the DBG is beautiful and offers lots to see and do. Last winter, it hosted an exhibit of some of the Chihuly glass…stunning! But, I digress. 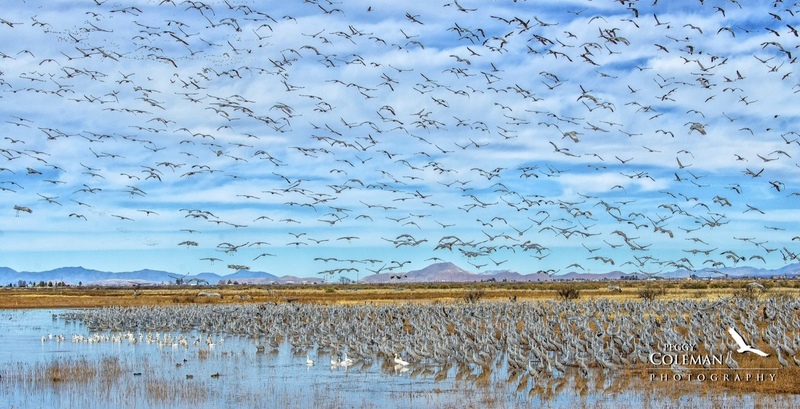 Recently, the Garden advertised a trip to Willcox, primarily to see the cranes and to take part in other birding experiences. Cranes, Wine, and Archaeology sounded interesting to me, especially since I had wanted to see the cranes for a long time. So, I signed up for the trip and wondered how I would like it. It was a fabulous weekend! The high point for all of us, and the focal point of the trip, was seeing the cranes, of course. We saw a few (maybe a hundred) on a brief birding trip not far from our hotel one afternoon. We saw other birds, as well, and that little adventure whetted our appetites for the next day’s activities. There’s no reason people can’t see the cranes on their own. Any local hotel will tell travelers to go to Whitewater Draw to view them. What they probably wouldn’t know to tell visitors is that the cranes sleep at the Draw, but they leave there very early in the morning and go elsewhere to feed. So, if you’re there around 7:30 a.m, you might see them all take flight, which would be amazing. But, it would also mean leaving your hotel around 6 a.m. to make sure you’re there on time. Once the cranes finish feeding on leftover grain in nearby fields, they return to Whitewater Draw, around 10:45-11 a.m. This is when we went to view them. And view them we did. Neither words nor pictures can describe what it’s like to see swarm after swarm of these large (and noisy) birds landing in marshes or fields a hundred yards away. We watched them for three hours. Several times there was a “scare off,” meaning something startled them into taking off and then circling to land again. It was spectacular; our leader estimated we saw more than 10,000 birds. And I didn’t have to get up at 5 to see them. In addition to seeing the cranes, we also visited one of the local wineries, for which the area is well known. We went to Coronado Vineyards where we ate tapas and sampled their wines. They were tasty and reasonably priced…we all walked out with a few (or more than a few) bottles. I particularly liked their Malbec and dry Riesling. On Sunday morning we had one more adventure, a trip to the Amerind Museum and Art Gallery. It’s a small but excellent museum dedicated to Native American archaeology, art, history, and culture. Our docent was outstanding, and I, for one, am fired up to learn a great deal more about the cultures of the peoples who inhabited this area long before I came along. I enjoyed the weekend very much, and I learned more than I could have imagined. I got advice on how to choose a good camera for wildlife photography. I discovered some good Arizona-produced wine. I saw a natural wonder of the world. And, I know that I will take many more trips to that area, because there’s a lot more there to discover.